The Honeywell TH8732WF5018 Lyric thermostat allows you access to your thermostat from your phone while ensuring optimal comfort for you and your family. The Lyric by Honeywell thermostat comes with Geofencing technology which permits the thermostat to utilize the location of your smart phone to save energy and money while you are away and then provides comfort when you return. The geofencing technology has two settings that allows you to set a 500 ft. or 7 mile radius depending on your usage and travel plans. You can disable it if you need to. You may program the thermostat using the custom programming option on the smart phone. Fine Tune technology allows the Lyric thermostat to take humidity levels and temperature into consideration when satisfying the requested temperature listed on the thermostat. Enabled with the Smart Cues technology your Honeywell TH8732WF5018 Lyric thermostat provides system updates directly to your smart phone. You are notified of air filter change reminders, upcoming maintenance, and any extreme changes in temperature that can harm your HVAC system. The Lyric thermostat by Honeywell it provides a visual indication of the mode of operation by changing the backlight color to Blue (Cooling), Red (Heating), and Green (Money Saving Mode). 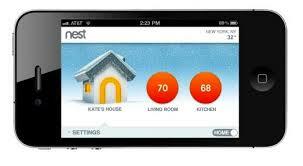 You can add a thermostat to every zone within the house and control them through the smart phone application. You can also control any thermostats that may be used in vacation homes, garages, or pool houses. The thermostat is easy to set up, it guides you through the set up process directly on the smart phone. No codes, just easy to understand directions allowing language choices of English, Spanish, or French. It is priced at about $270.00. 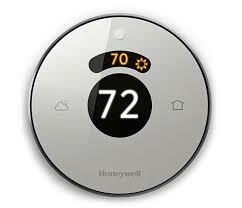 The Lyric thermostat by Honeywell works with most heating, cooling, and heat pump systems. It does not currently operate baseboard heat. The product is compatible with the iPhone and Android phones. At this time it is not compatible with the Blackberry and Windows devices. Swimming pools offer entertainment and relaxation, but it takes a backstage when the water is cold and uninviting. Swimming Pool heaters are a perfect addition to a home’s pool equipment. They allow the owner to maintain a comfortable water temperature for the morning, evening or late season swims. A swimming pool heater works by burning fuel to create heat, which is then passed through a heat exchanger and on to water drawn from the swimming pool. The water, now considerably warmer, is then reintroduced to the swimming pool, raising the overall temperature. Swimming pool heaters are available in various makes and models, with the basic difference being the type of energy the heater uses. Pool heaters may be natural, propane, or electric heaters. The heaters ignition style may be millivolt or electronic start. Millivolt heaters utilize a standing pilot that must stay lit constantly to initiate the pool heating process. An electronic start pool heater eliminates the need for keeping the pilot lit by electronically initiating the heating process. Ultra-efficient natural gas pool heaters and low-maintenance propane pool heaters utilize the latest in technology to ensure the pool’s water is kept at the temperature one likes. It is important to calculate the surface area of the swimming pool before purchasing a pool heater in order to determine how many BTUs it takes to warm the pool water. It may be more efficient to select a heater with higher BTUs. It helps warm the water faster and saves on heater’s running cost. The larger the BTU output of the pool heater, the quicker it heats the pool water. This means less run time on the heater and a longer overall heater life span. Always choose the largest pool heater. Solar pool heaters are the most efficient and are the least expensive way to heat the swimming pool since solar heat is free. 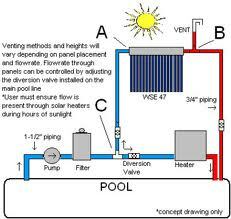 A solar pool heater can easily double the swimming season. Solar heating works by collecting free energy from the sun and transferring it to the pool they allow the pool to be opened early, and keep it open longer. Solar pool heaters also help reduce a pool’s carbon footprint. The solar pool heater is clean, easy, cost effective, and provides the owner swimming fun every year. 1. Size there Pool Heater appropriately. Note: a pool heater can never be too big. 2. Monitor pH closely. PH is probably the single biggest problem pool owners face with regard to pool cleaners and pool equipment in general. A pH level that is too low (acidic) will cause corrosion, and a pH level that is too high (base) causes mineral deposits that could potentially clog a pool heater’s plumbing. 3. Maintain correct flow rate. Backwashing their swimming pool filter or washing out the cartridge occasionally ensures that enough water gets to the pool heater for it to function efficiently. 4. To protect the investment. It is advised to use a pool heater cover to keep the heater protected from the elements. 6. Make sure the heater’s gas pressure is adjusted appropriately. A professional should complete this step at installation. A spot cooler is a portable, self-contained air conditioner used to cool a space. The entire unit is portable and can be moved to another space, if needed. The spot coolers are completely self-contained and do not have condensing units that need to be installed outside, like at the house. 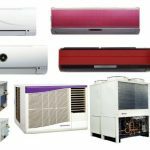 Air-cooled portable air conditioning systems are most often the system of choice for end-users and industry professionals. The fact that air cooled portable air conditioning units can be installed almost anywhere – usually in minutes – explains their popularity. They can be used for temporary cooling as needed. Spot cooling products can go with you in the yard while doing landscaping or gardening and in the garage for cooling home projects. Factories and warehouses benefit from the extremely low operational cost (less than $1.00 per day) of these powerful units, while keeping workers cool, thus increasing productivity and employee comfort. Spot/Portable air conditioner systems are often used to provide cooling relief outdoors and at events. Units are entirely self-contained, enabling quick and easy set-up, installation and breakdown at all events. The portable air conditioners are both ETL listed for outdoor use. This ensures safe cooling under strong sunlight and high humid conditions.  Brings outdoor cooling to areas area thought impossible to air condition.  Spot cooler can produce a comfortable environment, even in the hottest and stickiest of seasons.  Protect participants from the dangers of extreme heat during events. The Dallas Cowboys were the first NFL football team to use portable units for their summer workouts and the early season games at Texas Stadium. Some claim that, “Thanks to portable cooling that the Cowboys won the Super bowl! This, of course, is not a claim that can be proven, but may not be too far from reality. The same is true for athletes in training, construction work, and numerous other jobs in warehouses, factories and work areas where the temperature is hot. Working in a cool environment improves the efficiency of workers. Employees stay more alert and become less tired. Manufacturer of air treatment products, including air conditioners, air cleaners, dehumidifiers and humidifiers, and thermal technology products. Offers outdoor misting fans, misters, patio cooling systems, and high pressure misting systems. Manufacturer of portable air conditioners and spot coolers, available for rental or purchase. Portable air conditioner, providing cooling solutions for heat problems. Manufacturer of HEPA air purifiers and large capacity portable air conditioners for residential use. Manufactures outdoor cooling and misting systems, dust and odor control systems, portable fans, and garden accessories. Manufactures water and air cooled portable air conditioning systems. Manufacturer of portable A/C units and spot cooling systems 1-20 ton capacities. AirPac manufactures, sells, and rents portable air conditioners, spot coolers, and commercial portable heaters. Supplier and manufacturer of portable air conditioning and spot cooling supplies. 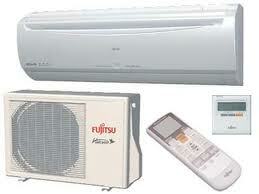 Manufacturer and vender of air conditioners and split system units. Manufactures CoolCube 10 portable air conditioning products for computer rooms, warehouses, and outdoor events that can stand alone, stack, or be mounted on a rack or ceiling. HVAC wholesale distributors of portable room air conditioners. Manufactures and distributes portable air conditioning solutions worldwide. Spot Coolers provides temporary and emergency air conditioning for people, equipment, and processes. February 26 was a watershed moment for the federal historic tax credit and the campaign to save it. On that day, Dave Camp (R-Mich.), chairman of the House Ways & Means Committee, released a discussion draft of his vision for a comprehensive tax that would eliminate the federal historic tax credit. The House Ways and Means Committee Chairperson released draft legislation, the Tax Reform Act of 2014, proposing a wide variety of changes to America’s tax system. The tax credit for energy-efficient property is for homeowners who install solar panels, solar-powered water heaters, geothermal heat pumps, small wind energy systems, and fuel cells in their home. This credit is worth 30% of the cost of the equipment, including any labor expenses to install the equipment. This tax credit is currently scheduled to expire at the end of 2016. 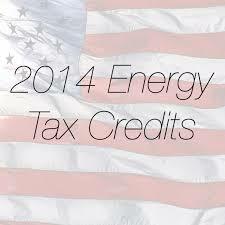 The Tax Reform Act proposes to repeal the Residential Energy Efficient Property Credit beginning with year 2015. This would increase tax revenues by $2.3 billion over 2014-2023, according to estimates provided by the Joint Committee on Taxation. The Ways and Means Committee did not offer any reasons for why these tax credits should be repealed. Section 3202 of the bill would repeal credits associated with biodiesel and renewable diesel. The biodiesel fuel-mixture credit, the biodiesel credit and the small agri-biodiesel producer credit, all of which expired at the end of 2013, would be repealed. Tax credits benefiting the bioenergy sector would also be impacted by the proposal. According to a bill summary released by the House Ways and Means Committee, Section 3206 of the bill would phase out and eventually repeal the credit for electricity produced from certain renewable resources, including closed-loop biomass and open-loop biomass. Under current law, the production tax credit (PTC) is 1.5 cents per kWh, indexed for information. 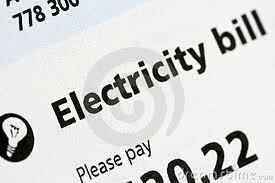 The summary said the amount of the credit was generally 2.3 cents per kWh in 2013. Under Section 3206 of the draft bill, the inflation adjustment of the PTC would be repealed, revering the PTC amount back to 1.5 cents per kWh. The credit would be repealed in 2024. The National Trust and its partners in preservation and allied fields have been working hard to raise awareness of the threat to the historic tax credit posed by Congressional tax reform. These events served as an affirmation that this work is more important than ever. While Chairman Camp’s discussion draft is unlikely to reach the President’s desk, his proposal to repeal the historic tax credit represents an unprecedented threat to the program. The Chairman’s proposal for comprehensively reforming the tax code very easily could, for example, serve as a basis for future tax reform efforts. The National Trust joined the Historic Tax Credit Coalition and Rep. Earl Blumenauer (D-Ore.) in immediately responding to the plan, calling for the survival of the historic tax credit in a reformed tax code. The Nest Learning Thermostat goes beyond this simple temperature detection to make a real impact in your HVAC energy consumption. A thermostat controls almost half one’s energy bill more than TVs, computers, appliances and lighting combined, but a lot of that energy is wasted. A properly programmed thermostat can cut your heating and cooling bills by 20%. The problem is 89% of thermostats are rarely or never programmed. Nest also makes it incredibly easy to adjust your schedule. 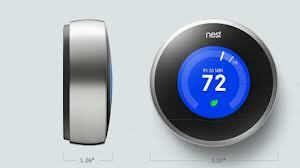 You can add, edit or remove set points in seconds from the Nest thermostat or the web and mobile apps. The Nest Learning Thermostat is simple. Nest works with its owners’ lives because Nest doesn’t need to be programmed: It remembers your temperature adjustments and programs itself. When you turn the temperature up or down, Nest remembers what you like and automatically creates a schedule for you. As your life or the weather changes, that schedule automatically adjusts as Nest learns your new preferences. Features like Auto-Away and Airwave automatically save energy. The Nest thermostat tells you when you’re choosing an energy-efficient temperature or exactly how long it’ll take to reach the temperature you want. Most people can install it themselves in about 30 minutes. Auto-Schedule: Turn it up when you’re cold, down when you’re hot. Nest will remember the temperatures you like and learn your schedule. And as your life changes, Nest’s schedule will automatically adapt. 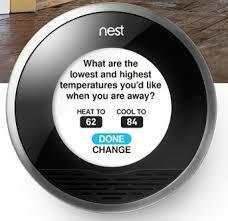 Auto-Away: Nest senses when you’re gone and turns itself to an energy-saving temperature that you choose during setup. Energy History and Energy Report: Nest shows you exactly when your system was on and what affects your bill the most. Nest Leaf: The Nest Leaf appears when you turn Nest to an energy-saving temperature or make an efficient choice in Nest’s settings. System Match: Nest uses SystemMatch to adapt to your system and activates features to maximize your comfort and savings. 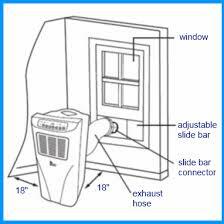 Airwave: Airwave automatically turns off the air conditioner (A/C) a few minutes early, but keeps the fan running. The air stays cool, but you’re A/C runtime drops 30%. You can connect the Nest thermostat to your home’s Wi-Fi network to control it from your iPhone, Android smartphone, iPad or computer. Software updates are loaded automatically as it stays connected to the Wi-Fi. Who Is Behind the Nest Thermostat? So, who is the brains behind Nest? Would you believe it’s the same brilliant mind behind the iPod and iPhone? Prior to 2008, Tony Fadell was a legend at Apple. Fadell is the father of the iPod, having led the Apple team that had developed the first 18 generations of the iPod and the first three generations of the iPhone. After he retired in 2008, Fadell concentrated on building his new house in Lake Tahoe. 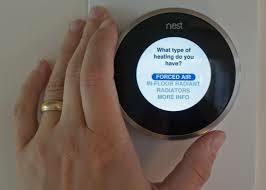 It was during that time that Fadell, who owns more than 100 patents, had an innovative idea to improve the thermostat. He took that vision to his former colleague Matt Rogers, who was responsible for iPod software development. Seeing value in the idea, Rogers joined Fadell in nurturing it to fruition. 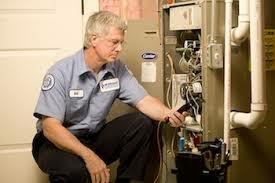 It is that time again to get your heating system checked out. 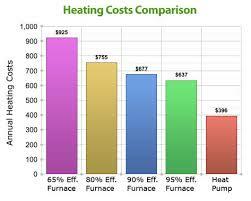 I may be an extra cost, but you can save money all winter if your furnace system runs as efficiently as possible. The furnace is one of the most expensive appliances homeowners have in their homes and it greatly influences the monthly utility bill. Getting the furnace checked is just as important as getting regular oil changes and tune-ups on your car. It’s an important and simple step to take in extending the life of your heating unit and helps reduce your monthly energy costs. It’s also important to change your filter on a regular basis. When a system is more than 10 years old, having it checked regularly by a qualified professional is essential. 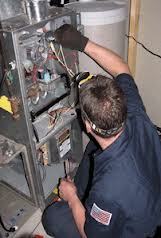 Furnace manufacturers all recommend annual inspections and maintenance by a qualified technician. They also have language in their warranties saying that damage to the units caused by improper maintenance is not covered under warranty. 1. The vent system needs to be checked for blockage and/or leakage. This includes the outside termination and the connections at and internal to the furnace. 2. Combustion gases must be analyzed and compared to the unit specifications. 3. The blower access door needs to be checked to make sure it makes a tight seal at the furnace. 4. The fresh air intake grills and louvers need to be checked for blockage. 5. The heat exchanger needs to be inspected for rust and corrosion. 6. The burners need to be checked for proper ignition, burner flame, and flame sense. 7. The drainage system needs to be checked for blockage and/or leakage. This includes the hoses internal to the furnace. The condensate drain and trap need to be cleaned, and the water replaced in the trap. 8. The blower wheel needs to be checked for debris and cleaned if necessary – this requires complete removal of the blower wheel. 9. 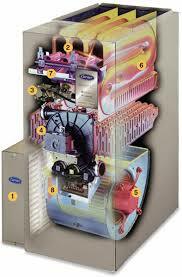 An amp-draw test should be conducted on the blower motor and compared with what is listed. 10. The wiring needs to be checked for corrosion and damage. 11. The filters need to be checked more frequently than annually. 13. Lubricate moving parts• Poor lubrication causes motor and shaft drag, requiring more electricity to overcome resistance. This can also help extend motor life. 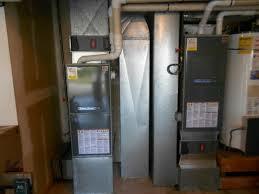 When hiring a company to do a tune-up on the furnace, ask them what is all is included. The company doing the work should provide you with a list of items they’ll check for on the furnace. 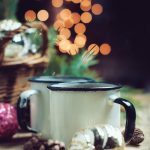 Keep in mind it is about preventative maintenance and catching a problem before the furnace quits working on a cold winter night. How Much Of Your Electric Bills Is The A/C Unit? 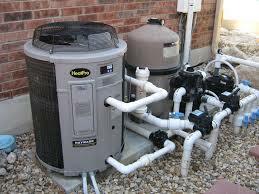 Do you ever wonder how much it costs to run your air conditioning (A/C) unit? There are simple calculations that can help you decide how much your AC is costing. 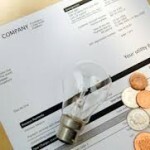 People are always surprised to see how much their monthly electricity costs. Here is an example of the cost to operate an in-room air-conditioning unit for a day and for a month. In general, the higher the BTU rating, the more electricity your unit pulls. And, of course, the energy draw varies by make and model. 2.94 x .147=.432 cents per hour during standard demand or roughly double during peak demand. Assuming 1,200 summer cooling hours, your total cost to run a 3 ton 10 SEER AC for a year can range between $516 and $1,023. If your air conditioner has a SEER rating below the 10 SEER used in this example, your air conditioning costs will be higher. For example, if you have an 8 SEER air conditioner, your system is 20 percent less efficient than a 10 SEER unit, so your cooling costs will be approximately 20 percent higher. If the air conditioner in a home or business is less than 10 SEER, it could be costing hundreds—even thousands of dollars annually. The kilowatt-hour (kWh) is the standard unit of measurement for electricity in the United States. This is 1,000 watts of electricity being used for one hour. To calculate how much your air conditioner costs to run for an hour, look for its wattage on the box or in the instruction manual and multiply this by the number of hours you use it each day. For example, a 1,000-watt air conditioner running for one hour consumes 1 kWh. By comparison, a 60-watt light bulb running for an hour uses 0.06 kWh (60 watts divided by 1,000). The cost of electricity varies by region. While the average cost in the US in 2011 was 12 cents per kWh, it was as high as 33 cents in Hawaii and as low as 8 cents in Idaho. 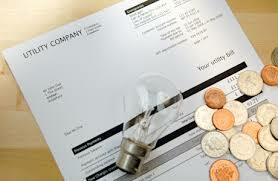 Check your electric bill to determine your cost. 1.2 kWh x $0.25 = $0.30 per hour to run your window air conditioner. 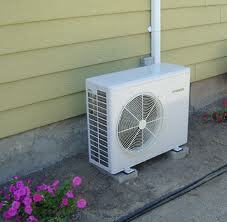 At 8 hours a day for 125 days of summer, your window air conditioner will have an annual running cost of $300 a year. A programmable thermostat can reduce the cost of central air conditioning if you program it at a higher temperature while you are at work and while you are sleeping. The temperature you set the air conditioning at should be relative to the outside temperature. If the temperature outside is 90 degrees, setting the air conditioning to 78 should feel quite comfortable in comparison. Drawing the blinds during the day and opening windows at night when it is cool can also save you money. When purchasing an air conditioner, look for Energy Star units, which use up to 14 percent less energy than government requirements and may entitle you to a tax credit of up to 30 percent of its cost. A ductless air conditioner, also called a mini-split system, has two major components: a unit mounted on an inside wall that delivers cool air to the room and a unit mounted on the outside of the house. A pair of refrigerant lines that runs between the two systems one delivering electricity, the other one taking away condensate. The system also has thermostatic control and a variable quiet blower. A split system has several advantages over a traditional window unit, first and foremost a thermostat that can keep the room at a constant, comfortable temperature instead of blasting on and off. Also, you don’t have to move a spilt system in and out of the window as the seasons change, and you don’t have the open-window security concerns of a moveable unit. The rapid growth in recent years of duct-free air conditioning systems in the U.S. has been impressive. In a contracting unitary market, Ductless mini-split style systems are very common in major markets in Asia and Europe; they have not made significant penetration into the United States. In spite of the recent growth in the U.S. market, they still only represent around 5 percent of the U.S. unitary air conditioning market. This low penetration is probably due to the huge installed base of larger U.S.-style homes and businesses that already have ductwork in place. Also, with the decline of new construction in the U.S., air conditioning purchases have been dominated by system replacements. And when an air conditioner needs to be replaced, it is usually easier and less expensive to continue using the existing ductwork and just replace the system with a traditional outdoor unit and indoor coil or air handler. Still, there are obviously some situations where ductless solutions make sense. Duct-free air conditioning provides good, economically sound solutions for smaller spaces which have no existing ductwork, and sales of these systems into U.S. applications will likely continue to grow to meet this demand. The top concerns about duct-free systems are indoor airflow and air quality, ease of service/troubleshooting for technicians, higher-than-expected costs and some concerns about general appearance. 3. Conduit (3″-4″ diameter) housing a power cable, refrigerant tubing and a condensation drain. 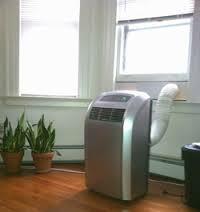 The condenser is installed outside the home or structure and the conduit is run from the outdoor unit to individual offices, bedrooms, living rooms, computer/server rooms, basements, anywhere a controlled temperature is desired. Wall-mounted interior units are then placed in the desired spaces to cool or warm air as needed by means of refrigerant flowing between the outdoor and indoor units through tubing in the conduit. Over half of all the ductless systems installed were 1.5 hp and below (less than 22,000 Btuh) and the majority were 2 hp and below (less than 27,000 Btuh). Over two-thirds of all ductless installations are done with single evaporator models. 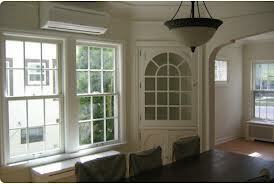 Approximately 85 percent of all ductless systems are probably installed in commercial applications. The most common ductless mini-split applications in the U.S. would typically be those going into single space, commercial buildings and, to a lesser extent, some suitable ductless applications in small residential spaces such as those involving room additions or smaller, zoned apartments. Units can be difficult to install, and it’s harder to find qualified professionals to do the work, as most are used to putting in duct systems. 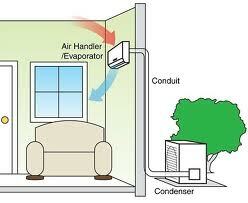 Second, Ductless split air conditioning units have leaks. There are leaks that occur, which are hard to fix. Third, it’s important to purchase the right sized unit, as a unit that is too small will not effectively cool the home and one that is too large will not remove enough moisture. The price of ductless split air conditioner units range from around $1,500 to $5,000, depending on the BTU and overall efficiency. These units typically cost $1,500 to $2,000 per ton (12,000 BTU per hour). The overall cost of the unit will depend on the square footage that is needed to cool and the type of efficiency needed. Choosing to get a high-efficient air conditioner, such as a SEER (Seasonal Energy Efficiency Ratio) brand, costs more money for the actual system, but saves money on energy bills.